Most climate scientists believe that if we continue to add greenhouse gases to the atmosphere at the current (and accelerating rate) for the rest the century the resulting climate change would likely be catastrophic for our civilization. It is generally accepted that in order to have a reasonable chance of avoiding such climate change, we need to limit the total increase in atmospheric temperature to two degrees C (3.8° F) above pre-industrial times. And the current climate models suggest that in order to have a reasonable (66%) chance of doing this, we need to limit net worldwide greenhouse gas emissions to about 485 billion tons of carbon (the “carbon budget”) after 2011. The next worldwide agreement on reducing greenhouse gases is expected to be signed in Paris in December 2015, with the agreement taking effect in 2020. The hope is that the countries of the world will voluntarily agree to limit their emissions in such a way that the “carbon budget” will not be exceeded and, as a result, the global temperature increase can be limited to two degrees C. However there are three very serious problems – (1) the two degree limit will very likely be exceeded even if all greenhouse gas emissions were ended today; (2) there is no equitable way to reduce greenhouse gas emissions at a pace fast enough to limit future emissions to 485 billion tons of carbon at a cost that we are willing to pay, particularly given the first problem, and (3) even if the global warming could be stopped at one degree C, the sea level rise would be catastrophic. So 2015 will likely go down in history as the year that we finally realized that it will be impossible to meet the 2 degree C limit. It is technically possible for the world to limit net greenhouse gas emissions to 485 billion tons this century. With expected emissions of about 127 billion tons through 2020 (when the climate agreement is to be signed), the budget after 2020 will be about 358 billion tons. With global emissions expected to be about 15 billion tons in 2020, emissions would have to be reduced around 3.5%/year to stay within the budget. Not only are the necessary changes to our energy and agricultural systems unlikely, but complicating matters is the fact that the US pledge (about 170 billion tons from 2012-2080) is way, way short of what is needed, resulting in over 10 percent of the world’s emissions budget being consumed by a country with 4.3% of the world’s population. (See “US Emissions Reduction Pledge” below). Not to mention that the countries with the largest populations (China, India, etc.) expect their emissions to grow through at least 2030. The fact that sea level (at equilibrium) is directly tied to the Earth’s temperature (as long as there are glaciers) should be obvious. Estimates of the expected sea level rise per degree C range from 10 to 20 meters, so if the Earth stopped warming tomorrow, the expected equilibrium sea level would be about 24 feet higher. With a two degree warming, we should expect at least 60 feet. Although this will take centuries, a sea level rise of 8 inches to a foot per decade can be expected in the next century. (See “Sea Level Rise” below). The melting of the summer-time sea ice in the Arctic Ocean and the retreating of the snowline will likely add at least one degree C of warming (considering this would about double the current radiative forcing, and the current radiative forcing has already increased the Earth’s temperature .8 degrees C and is expected to raise it even more). Professor Wadhams estimates the present summer area of sea ice at 4 million square km, with a summer albedo of about 0.60 (surface covered with melt pools). When the sea ice disappears, this is replaced by open water with an albedo of about 0.10. This will reduce the albedo of a fraction 4/510 of the earth's surface by an amount 0.50. The average albedo of Earth at present is about 0.29. So, the disappearance of summer ice will reduce the global average albedo by 0.0039, which is about 1.35% relative to its present value. As NASA describes, a drop of as little as 0.01 in Earth’s albedo would have a major warming influence on climate—roughly equal to the effect of doubling the amount of carbon dioxide in the atmosphere, which would cause Earth to retain an additional 3.4 watts of energy for every square meter of surface area. Based on these figures, Professor Wadhams concludes that a drop in albedo of 0.0039 is equivalent to a 1.3 W/sq m increase in radiative forcing globally. 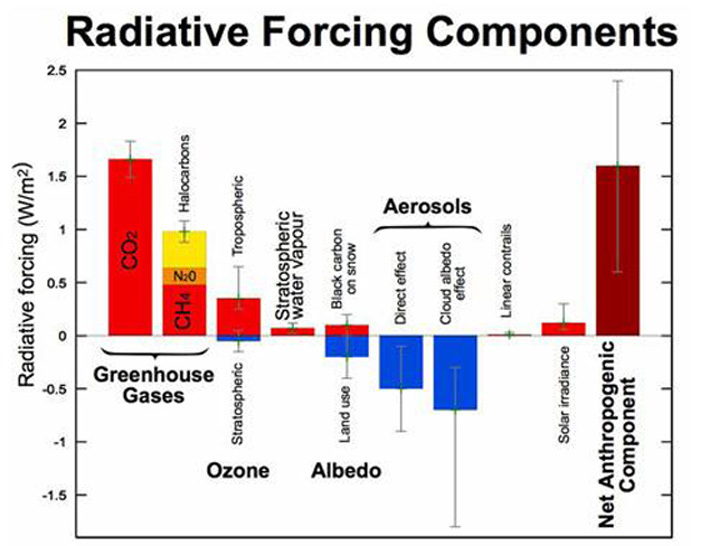 The albedo change resulting from the snowline retreat on land is similarly large, so the combined impact could be well over 2 W/sq m. By comparison, this would more than double the net 1.6 W/sq m radiative forcing resulting from the emissions caused by all people of the world (see IPCC image below). Carbon released from permafrost soils will likely have a very significant impact on future temperatures (perhaps .5 degrees C by 2100 and certainly more by 2200), and “as of 2011, no climate model incorporates the effects of methane released from melting permafrost, suggesting that even the most extreme climate scenarios in the models might not be extreme enough”. Permafrost temperatures are increasing over Alaska and much of the Arctic. Regions of discontinuous permafrost in interior Alaska (where annual average soil temperatures are already close to 32°F) are highly vulnerable to thaw. Thawing permafrost releases carbon dioxide and methane – heat-trapping gases that contribute to even more warming. Recent estimates suggest that the potential release of carbon from permafrost soils could add as much as 0.4ºF to 0.6ºF of warming by 2100.46 Methane emissions have been detected from Alaskan lakes underlain by permafrost, 47 and measurements suggest potentially even greater releases from thawing methane hydrates in the Arctic continental shelf of the East Siberian Sea.48 However, the response times of Arctic methane hydrates to climate change are quite long relative to methane’s lifetime in the atmosphere (about a decade).49 More generally, the importance of Arctic methane sources relative to other methane sources, such as wetlands in warmer climates, is largely unknown. The potential for a self-reinforcing feedback between permafrost thawing and additional warming contributes additional uncertainty to the high end of the range of future warming. The projections of future climate shown throughout this report do not include the additional increase in temperature associated with this thawing. In total, the northern permafrost region contains approximately 1672 Pg [1,672 billion tons] of organic carbon, of which approximately 1466 Pg, or 88%, occurs in perennially frozen soils and deposits. This 1672 Pg of organic carbon would account for approximately 50% of the estimated global belowground organic carbon pool. The worrying news, no matter how you dice the de-icing permafrost findings? "There's so much carbon stored in northern permafrost soils that even if, say, 10 percent of that carbon is released through the processes we studied, it would still have a big impact," Cory said. She calculated that "conservative" scenario would raise atmospheric carbon dioxide levels by 75 to 80 parts per million — over and above the effects of continued fossil fuel burning and other causes. And that, she said, would lead to "a lot of warming." Permafrost stores an immense amount of carbon and methane (twice as much carbon as contained in the atmosphere). In a warming environment, permafrost is expected to degrade, and these gases which have been in storage will be released. This process has already begun in some parts of the world, including western Siberia, and is expected to increase in earnest by the year 2020. Furthermore, as of 2011, no climate model incorporates the effects of methane released from melting permafrost, suggesting that even the most extreme climate scenarios in the models might not be extreme enough. Researchers at the National Snow and Ice Data Center estimate that by 2200, 60% of the Northern Hemisphere's permafrost will probably be melted, which could release around 190 billion tons of carbon into the atmosphere. This amount is about half of all the carbon released in the industrial age. The affect this will have on the rate of atmospheric warming could be irreversible. At the very least, these estimates mean fossil fuel emissions will have to be reduced more than currently suggested to account for the amount of carbon expected to discharge from melting permafrost. The burning and drying of the world’s peat bogs might add considerable carbon dioxide to the Earth’s atmosphere, but the amount and timing is not certain. Merritt Turetsky, an ecosystem ecologist at the University of Guelph, Ontario, and colleagues report in Nature Geoscience that peatlands cover between only 2% and 3% of the planet's land surface, but store 25% of the planet's soil carbon. [T]hey cover about 400,000 square kilometers and store 100 billion tons of carbon. The entire pool of atmospheric carbon, in the form of carbon dioxide, adds up to about 850 billion tons. In a Nature study in 2002, she calculated that a dramatic and sustained forest fire in Indonesia in 1997 may have sent 2.5 billion tons of carbon into the atmosphere – a figure that could have added up to 40% of all the emissions from all the fossil fuel burning that year. "Tropical peatlands are highly resistant to natural fires, but in recent decades humans have drained peatlands for plantation agriculture," she said. "People cause the deep layers of peat to dry out, and also greatly increase the number of fire ignitions. It's a double threat." The Obama “Climate Pledge” (deemed “ambitious” by the White House) would have the US, with 4.3% of the world’s population, consume 10% of the world’s carbon budget – incredibly short of what is needed. In addition, if emissions from manufacturing goods in China were included, US emissions in 2012 would have been about 8% (528 MTCO2E) higher. Building on strong progress during the first six years of the Administration, today President Obama announced a new target to cut net greenhouse gas emissions 26-28 percent below 2005 levels by 2025. At the same time, President Xi Jinping of China announced targets to peak CO2 emissions around 2030, with the intention to try to peak early, and to increase the non-fossil fuel share of all energy to around 20 percent by 2030. The new U.S. goal will double the pace of carbon pollution reduction from 1.2 percent per year on average during the 2005-2020 period to 2.3-2.8 percent per year on average between 2020 and 2025. This ambitious target is grounded in intensive analysis of cost-effective carbon pollution reductions achievable under existing law and will keep the United States on the right trajectory to achieve deep economy-wide reductions on the order of 80 percent by 2050. Since US GHG Emissions (CO2, Methane, etc.) were 7109 million metric tons CO2 equivalent in 2005, emissions for 2025 are expected 5190 MTCO2E and emissions for 2050 are expected to be 1422 MTCO2E. If emissions are reduced at the rate 1.75%/year from 2012-2025 (reaching the target of 5190 in 2025) and 5.04%/year from 2026 to 2050 (reaching the target of 1422 in 2050) and then continue at the same rate through 2080, the total US emissions through 2080 will be about 173,631 MTCO2E, about 10% of the world’s budget – and this pledge is touted as “ambitious” by the Obama administration! · The United States has been responsible for over 25% of total emissions so far. · If emissions from manufacturing goods in China were included, US emissions in 2012 would have been about 8% (528 MTCO2E) higher (http://www.forbes.com/sites/anaswanson/2014/11/12/heres-one-thing-the-us-does-export-to-china-carbon-dioxide/). Up to a 2 degree C increase, the expected equilibrium sea level rise is about 10 meters per degree C (8 feet per degree F), with at least 3 feet of sea lever rise expected by 2100. After the end of the last glacial maximum, sea levels rose about 10 mm/year on average, and at one point rose at about 30 mm/year. Since the Earth is warming much faster now than it was as the last ice age ended, perhaps 20 mm/year (8 inches/decade, or 7 feet a century) is to be expected in the future. This is about nine times the current rate.